Fire eating stage show for Columbia Gas corporate event. Choreographed fire poi routine at house party. Stationary fire entertainer at bar event. 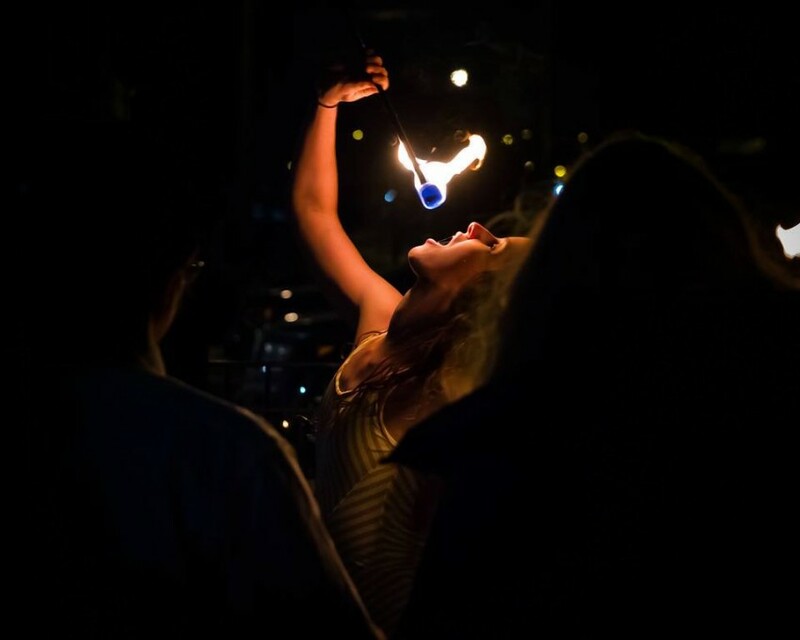 Put that extra spark into your event by hiring Alexa the Fire Tamer, a fire dancer that can entertain any crowd at any event. From children to adults, corporate events to weddings, she will create an unforgettable experience for your guests. 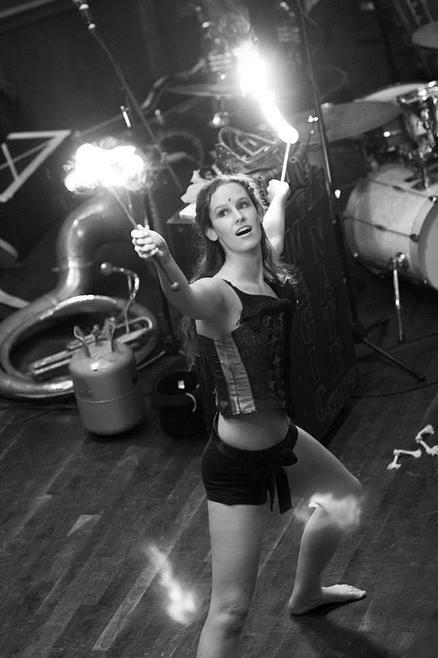 Her services include fire eating/fire fleshing, fire poi twirling, glow poi twirling, and stilting. She can be hired for stage shows, as a roaming entertainer, or anything in between! Insurance: $1,000,000 - Commercial General Liability with additional insured endorsement, Waiver of Subrogation, Primary Non-Contributory Endorsement, Legal Liability to Audience Participants, Medical Payment for Audience Participants. The three main acts I provide are fire performance, glow performance, and stilt walking. Fire performance can be a choreographed stage act or a stationary/ ambience act. Both types of acts can include fire poi spinning (balls of flame attached to metal chains, spun around the body in rhythmic patterns) and fire eating/ fleshing. Fleshing involves the fire eating torches being dragged along the skin. 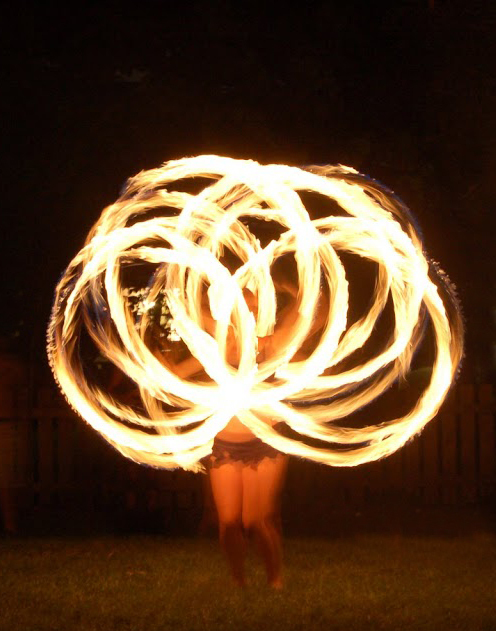 Both are forms of fire dancing, and look best when accompanied by some type of music. When fire isn't possible, I do poi spinning with LED glow poi. Even though the LEDs are very bright, they do not show up well in daylight or bright indoor lighting. I use 37" stilts for stilt walking. I am available to stilt walk in parades or as a wandering entertainer– interacting with people and/or spinning LED glow poi. I am a fully insured fire, stiltwalking and glow poi performer and have performed at a variety of events including festivals, parades, concerts, corporate events, fundraisers, and much more. I have been performing for five years in Columbus, Ohio, and recently relocated to Duluth, MN.